Sometimes when you hear some peoples name, you begin to dey wonder if that is that persons real name example is my Neighbor, my land ladies daughter in Ado-Ekiti : at the mention of her name I always laugh. 1. Itutu (Pit): you will wonder if people wanted to be called that kind of name but the meaning is unique. Every pregnant woman when in labor they feel like going to toilet; so in the old days when things like this happen and eventually the woman gave birth in the pit; automatically the child’s name is Itutu (pit) in English language. 2. Okekere: A child born with rounded in shape head. 3. Anusoze (Traveler): when you a pregnant woman is traveling an gave birth on her way the child is automatically given Anusoze (Traveler). 4. Ajoze: Similar in meaning to Anusoze but these one is more or less a woman that gave birth on just the way without traveling. May be she just stroll out to get something for her self in the market and on her way back gave birth the child is automatically named. 6. Ogwanchi. A child born in the bush. 7. Ihiampe – Smallest in the family, or the last born. 8. Anate (the hidden). – The child born without knowing the mother was pregnant. 9. Onuya (the wretched). – The child born while the parent were suffering. Be careful cause the child may become poor in future. 10. Omelukwo – A child born when the parent has no money to buy the child soap for bathing. What do you think about this: drop your comments below, and please locate the share button below to share with your friends online. Thanks for reading. Do you have news or anything info-mating? please send to binoosmart@gmail.com | +2348168374589. 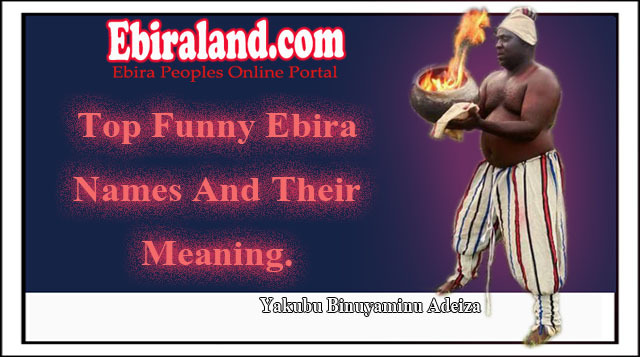 Homepage | Ebira Music | History | Ebira Language | Kogi News | Tech | Politics | Celebrity Gists | Relationship Tips | How-To. Next articleEbira Movie: Top 10 Ebira Movies You Need To Watch. Thanks for your Sincere Opinion i think you are right thanks again.